V Sentry provides end-to-end VMware visibility. SentryOne V Sentry provides SQL Server DBAs and VMware Administrators a unique view of resource utilization for VMware hosts. 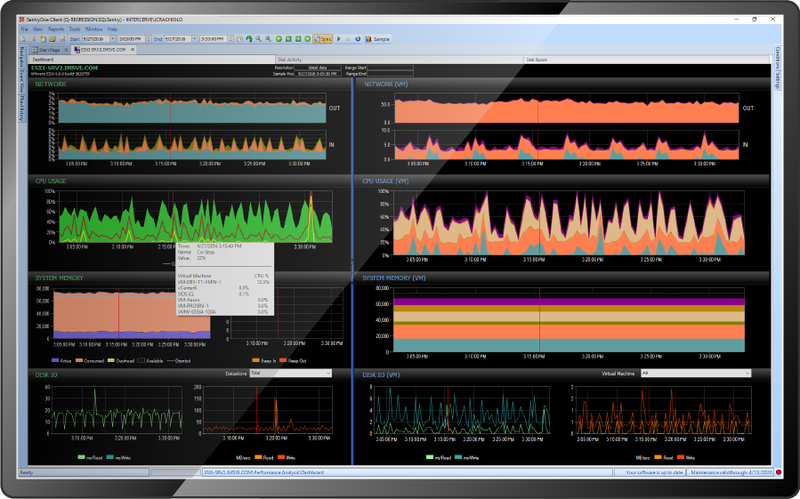 Analyze network, CPU, memory, and storage performance for VMware hosts and their virtual machines. DBAs and VMware administrators now both have the visibility to see what, where, and why VMware Host performance is slow. Identify at a glance VMs that are using the most resources. The main V Sentry performance dashboard displays a breakdown of how each server resource is being used by VMs. Easily view the VMware measurements for ready-time percentage and co-stop percentage relative to CPU usage. With this view, you can quickly determine whether a CPU is overcommitted or VMs need to be right-sized. Get a view across both the database server and the virtual storage resources to truly understand I/O performance for the combined environment. This activity view is particularly helpful for DBAs who typically have only the view of storage performance from their database servers. Easily determine which virtual machines are using the most disk space through V Sentry's graphical view of storage capacity. Get an end-to-end view of performance across the entire application stack and the underlying virtual infrastructure, including Tintri VM-aware storage. The dashboard shows the performance differential of SQL Server, Windows, Hyper-V, and Tintri storage layers over time for efficient root cause analysis. Use the Windows performance dashboard to view real-time performance metrics, or switch to history mode. Easily jump to the Event Calendar or Processes to determine exactly what was happening when you experienced problems. Get easily configurable, highly customizable cloud access to your performance data. When you want to perform root cause analysis, get a grip on workload performance, or really understand the health of your data platform, SentryOne is the right solution to rapidly provide deep insight. SentryOne facilitates a DevOps culture and empowers your team’s agility, supporting your mission to constantly deliver value to the business through high-performance data systems. V Sentry is a must-have for teams running SQL Server systems on top of VMware. As part of the SentryOne platform, V Sentry provides integrated visibility between the host layer and the guest layer, presenting key virtualization metrics. Using a single screen, get full insight into where your environment may be experiencing performance issues. At SentryOne, we are committed to ensuring our customers get the most from their data platforms. Our motivated customer success team will directly engage with you so you can start improving your data platform performance today. *License option requires year one annual maintenance ($299) and provides technical support via e-mail and phone, software updates and version upgrades. Subscription pricing is based on a 12 month term paid in advance with automatic renewal at the end of the term. How many VMware instances to quote?